About a week ago, my birding buddy, Shawn Conrad, and I went to Scenic State Park which is near Big Fork in northern Minnesota. We didn’t see many birds but the quality of the sightings more than made up for the small quantity. 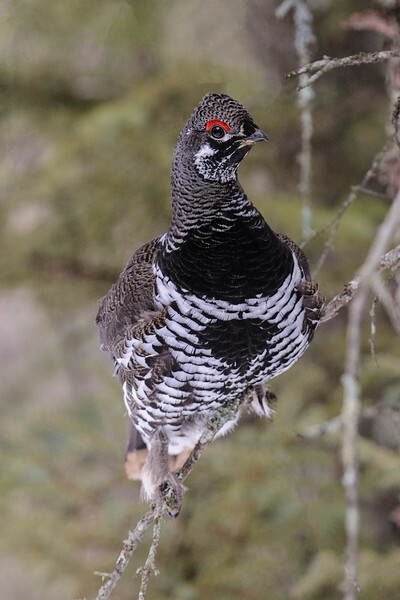 One of our target species was Spruce Grouse and we actually saw two of them, both colorful males. We were walking along the ski trail and saw one in a tree above our heads. It was content to stay in the tree and didn’t give me a chance to get a good photo. Just a little farther down the trail we saw this one and it was very cooperative. It hopped up on the snow bank along the edge of the trail and sat very still. (Grouse seem to think that if they don’t move, you won’t be able to see them.) But the lack of any vegetation behind him, and the snow covering the ground, made for an outstanding photo of this elusive species. 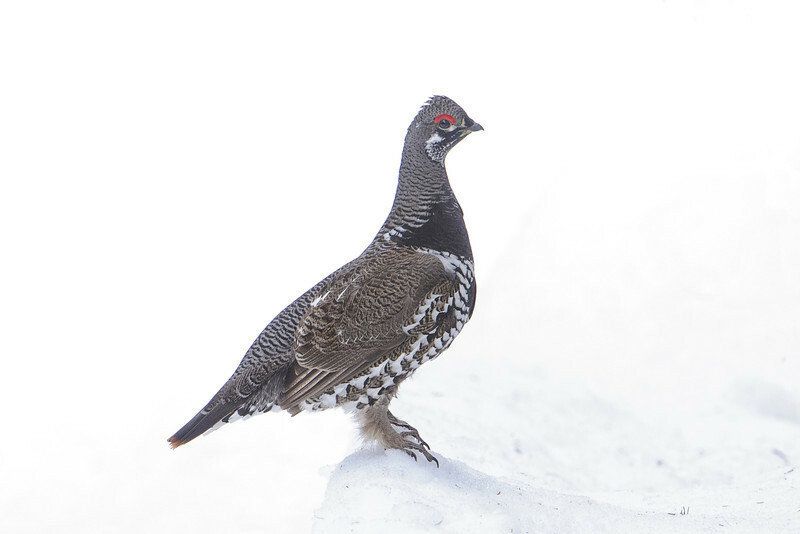 The Spruce Grouse hopped onto a branch along the trail and I was able to get some shots from the front. This is a really beautiful bird. 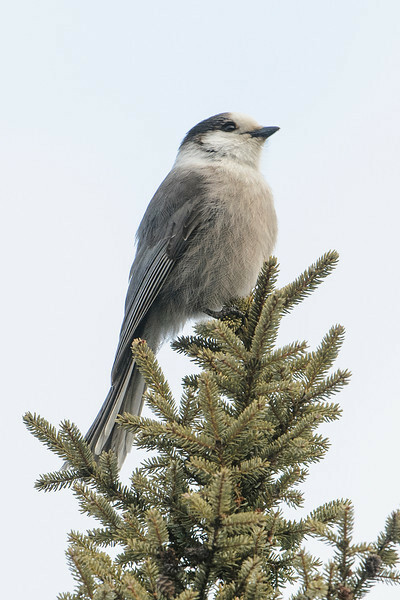 Several Gray Jays were seen during our walk in the park. They’re not a rare species but I always enjoy seeing them. 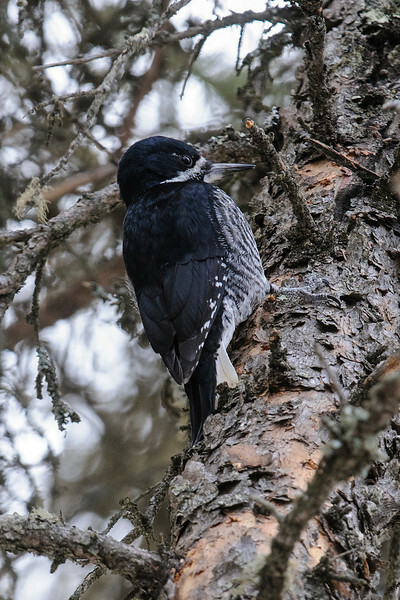 We felt very fortunate to find a pair (male and female) of Black-backed Woodpeckers which are a rare species. This is the female; I didn’t get a good photo of the male. He looks very similar but has yellow feathers on the top of his head. They are about the same size as Hairy Woodpeckers. This winter, a few Great Gray Owls were seen in northern Minnesota, but we didn’t have a large influx of them like we did several years ago. Shawn and I saw one Great Gray Owl just before we got to the park but it was still too dark for a photo. After we left the park, on a county road between Big Fork and Effie, we spotted this Great Gray. 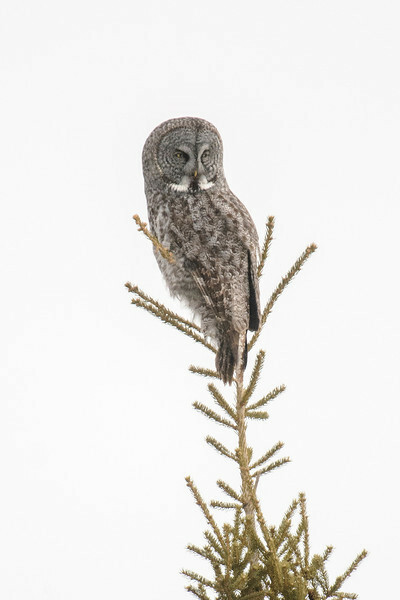 I’m always amazed to see one sitting on top of a thin branch like this because they are the biggest owl species we have. However, they only weigh about 2 ½ pounds; they’re mostly feathers. P.S. That day we also saw Northern Shrike, Rough-legged Hawk, Northern Goshawk, Trumpeter Swan, and several Black-billed Magpies. That's why I said it was such a good birding day.